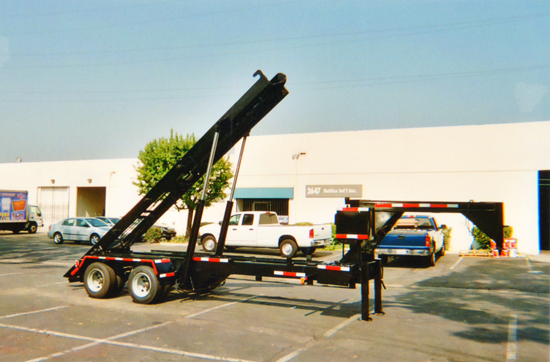 We build custom rolloff units to fit trucks and trailers. Also portable storage bin lifters that are truck mounted. Above is a 20' model trailer. 24,000 GVW and 12,000 lb. axles. It has hydraulic brakes and a reaving cylinder system. The trucking industry is changing with the utilization of rolloff trailers saving costs of operation, smaller trucks, insurance costs, licensing, and fuel. All units are custom built and will pick up any standard container. We have been building bin lifting units to handle all types of bins for a number of years. Above is a storage bin lifter - see Projects page. © Copyright 2009 Rolloff Systems. All Rights Reserved.